Self-imposed selfie of NASA’s Curiosity Mars rover. Mars has been found to have had liquid water much longer than previously believed. This new finding further expands the window for when life might have existed on Mars. However, whether this groundwater could have sustained life remains to be seen. 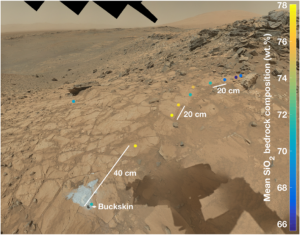 This research focuses on lighter-toned bedrock that surrounds fractures and comprises high concentrations of silica — called “halos” — that have been found in Gale crater on Mars. The true detective is the NASA Curiosity rover. Mosaics of images from the navigation cameras on the wheeled robot show these halos that comprise high concentrations of silica. That indicates liquid groundwater flowed through the rocks in Gale crater longer than previously believed, explains Jens Frydenvang, a scientist at Los Alamos National Laboratory and the University of Copenhagen and lead author of the paper. Marias Pass observations: Mars Hand Lens Imager mosaic acquired on sol 1065. View is toward the southeast, and the summit of Aeolis Mons (Mount Sharp) is observed in the background. 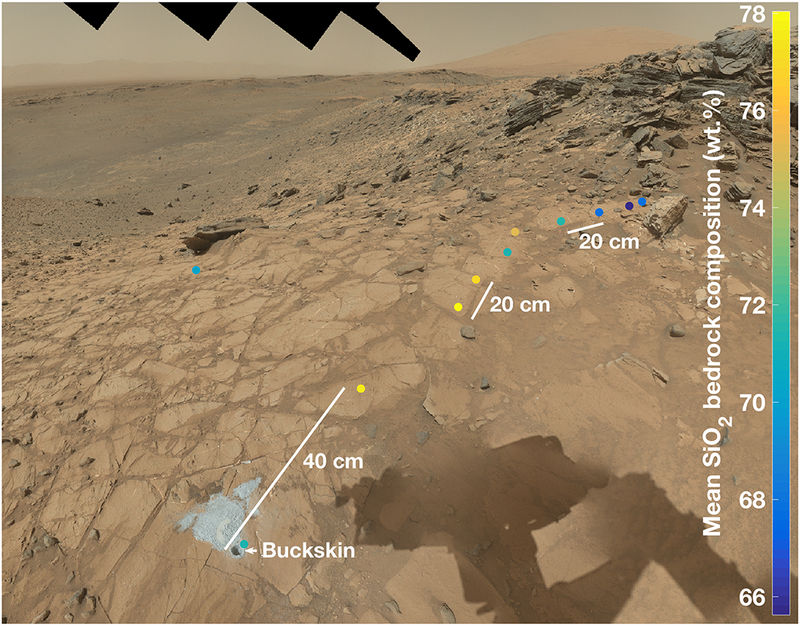 Colored dots represent the locations of ChemCam Murray formation observations; colors indicate the mean bedrock silica content. The dark-toned bedrock and loose cobbles at the upper right are Stimson formation rocks. 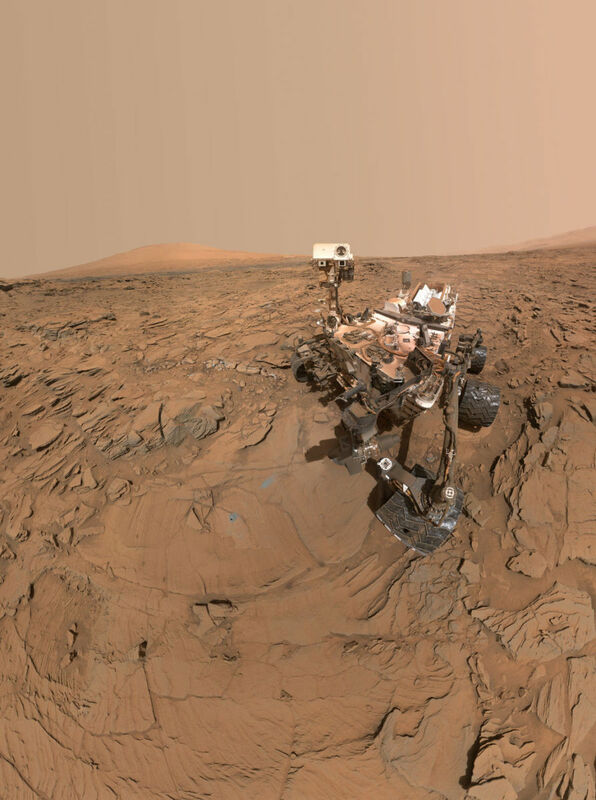 “The goal of NASA’s Curiosity rover mission has been to find out if Mars was ever habitable, and it has been very successful in showing that Gale crater once held a lake with water that we would even have been able to drink,” Frydenvang states in a Los Alamos National Laboratory press statement. 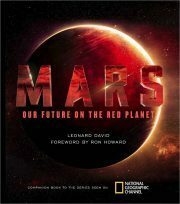 This new study buttresses recent findings by another Los Alamos scientist who found boron on Mars for the first time. Boron also indicates the potential for long-term habitable groundwater in the planet’s past.